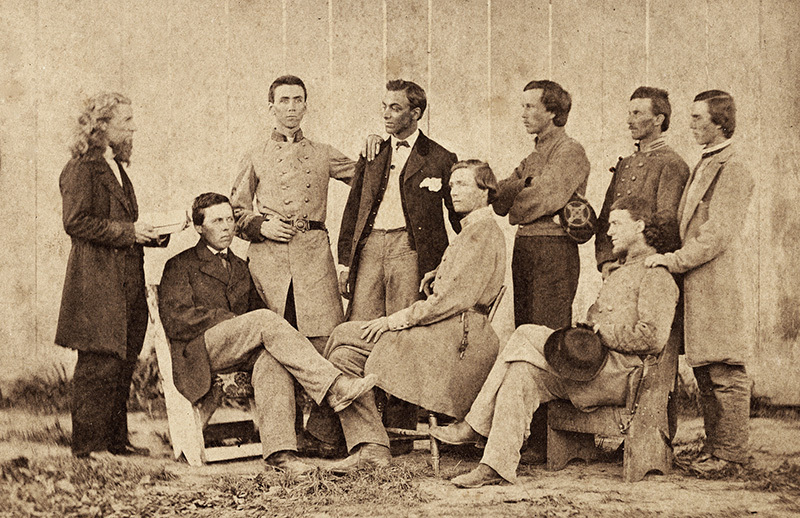 The 1837 General Assembly of the Presbyterian Church in the U.S.A., chiefly remembered for the church schism between Old School and New School that occurred there, is also notable for launching the first national Presbyterian foreign mission board, the origin of today's Presbyterian World Mission (PWM). A highly fraught decision in a GA torn by controversy, it was the result of an overture made by the Synod of Pittsburgh, which proposed that the national church take over the work of the Western Foreign Missionary Society, the synod's missionary-sending organization. The 220th General Assembly, to be held in Pittsburgh, June 30 through July 7, 2012, marked 175 years of Presbyterian World Mission. However, the denomination's commitment to missions is considerably older, and much of this history is rooted in Western Pennsylvania. It is no accident, then, that the overture which established the first Board of Foreign Missions emerged from that region. Presbyterians have been thick on the ground in Western Pennsylvania since the late colonial period. Though Presbyterians can trace their origins in North America to the earliest settlements in New England, it was the great migration of Scotch-Irish in the eighteenth century that inflated their numbers, making Presbyterians one of the largest denominations in the colonial era. Some 200,000 to 500,000 Scotch-Irish Presbyterians made their way across the Atlantic between 1717 and the beginning of the American Revolution. They came mostly to the middle colonies of New York, Pennsylvania, and Delaware. Some of these immigrants decided to travel west beyond the Allegheny Mountains where land was cheap though dangerous due to the hostility of Native Americans. In 1758 during the French and Indian War, the French Fort Duquesne fell to the British and was renamed Fort Pitt after British Prime Minister William Pitt; the fort is the origin of the modern city of Pittsburgh. With the establishment of this British fort, immigrants flooded into Western Pennsylvania, with the height of the migration during the years just prior to the Revolution, 1769 to 1774. The settlers included many Presbyterian Scots and Scotch-Irish. The year 1758 also saw the temporary healing of the Presbyterian schism between the Old Side and New Side with the formation of the Synod of New York and Philadelphia. Seizing the opportunity to promote Presbyterianism in Western Pennsylvania, the synod employed army chaplains and ministers to work in the area to establish churches among the new settlers. In 1781 this resulted in the establishment of the Presbytery of Redstone, which included a huge area that, as the population increased and churches grew, was subdivided into a number of new presbyteries. Since Western Pennsylvania Presbyterianism was established in a missionary spirit, mission seems to have been encoded in the DNA of these Presbyterians, a genetic characteristic that survives today. 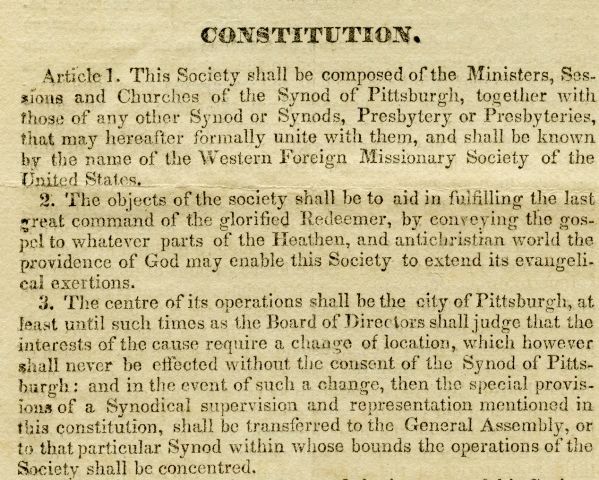 When the Presbyterian Church in the U.S.A. established the Synod of Pittsburgh in 1802, the new body passed a resolution committing itself "to diffuse the knowledge of the gospel among the inhabitants of the new settlements; the Indian tribes, and if need be, among the interior inhabitants, where they were not able to support the gospel." True to their resolution, Presbyterians of the new synod sought to evangelize not only their own region of Western Pennsylvania but also settlements in Ohio and Indiana. They also reached out to evangelize the Indian nations of the Sandusky and Maumee river valleys in Northwest Ohio, and following the War of 1812, Presbyterians went further west to evangelize Native Americans in Michigan, Illinois, and beyond the Mississippi River. "A Communion Gathering in the Olden Time"
The missionary spirit of Presbyterians in Western Pennsylvania reflected the larger Protestant mission movement of the time. 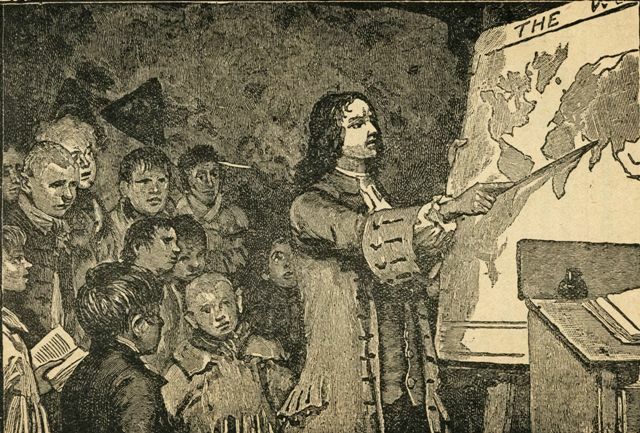 In the early 1800s, the Second Great Awakening was launched in part by camp meetings, an idea borrowed from the "communion seasons" held in Scotland and Northern Ireland among Presbyterians. One of the ministers who introduced this idea into the American frontier was the Scotch-Irish Presbyterian James McGready of the Gasper River Church in southwest Kentucky. 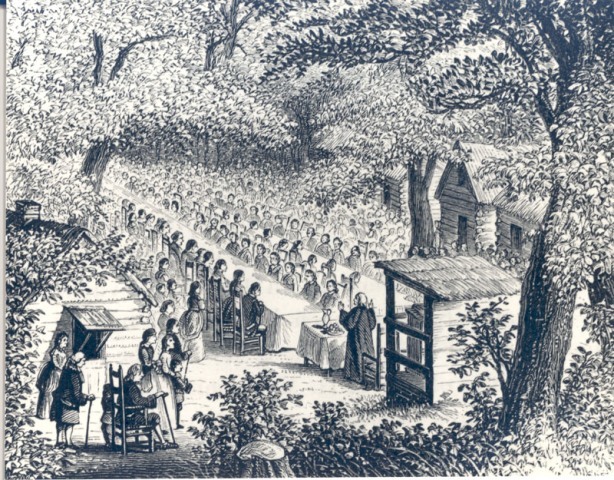 The next year, 1801, a camp meeting at Cane Ridge in Bourbon County, Kentucky, gained national attention and launched a new movement in American Protestantism. In the midst of this growing attention to what would later be called "home" missions, the Presbyterian Church in the U.S.A. established the Standing Committee of Missions in 1802, becoming the first Protestant denomination in the United States to form a national mission organization. Later, Presbyterians would also work through the American Home Missionary Society in cooperation with the Congregational, Dutch Reformed, and Associated Reformed Churches. 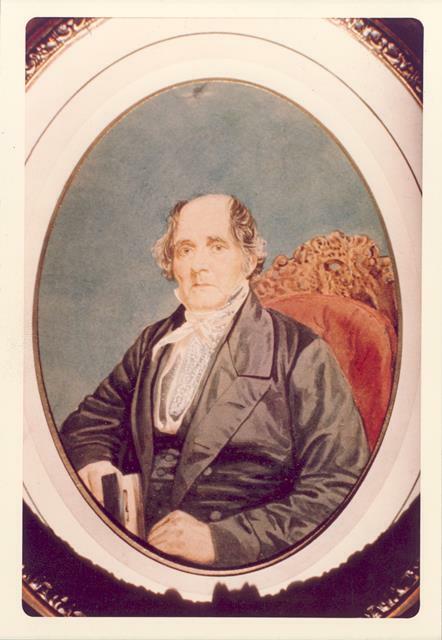 In Great Britain, William Carey had launched the modern foreign mission movement in 1792 with his famous book, An Enquiry Into the Obligation of Christians to Use Means for the Conversion of the Heathens and, in the following year, the establishment of the Baptist Missionary Society in England. The idea of foreign missions crossed the Atlantic in the first decade of the new century with the famous Haystack Prayer Meeting in 1806 at Williams College, Massachusetts, and the establishment four years later of the American Board of Commissioners for Foreign Missions (ABCFM). Though founded by Congregationalists, the American Board was non-denominational, and many Presbyterians supported its work. The Controversy: Do Presbyterians Need Their Own Foreign Mission Board? For Presbyterians the existence of the ABCFM raised an important theological question: should mission work be rightly relegated to an independent society (essentially a para-church organization), or should it be integral to the nature of the church and therefore an enterprise of the denomination? Those who took the former view, it was argued, might see mission as something that individual Presbyterians and congregations could do on an optional basis. Those who took the latter view believed mission was at the heart of what it meant to be the church of Jesus Christ. 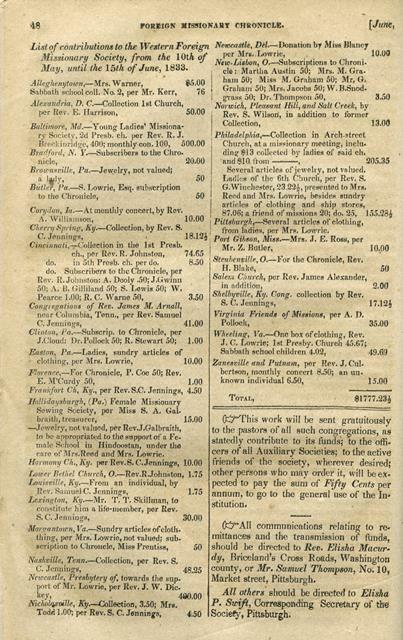 Overtures were presented to PCUSA General Assemblies in 1812, 1828, and 1831 calling for the establishment of a Presbyterian foreign mission board. The issue, unfortunately, became part of a new division of the time between the Old School and New School wings of the church. 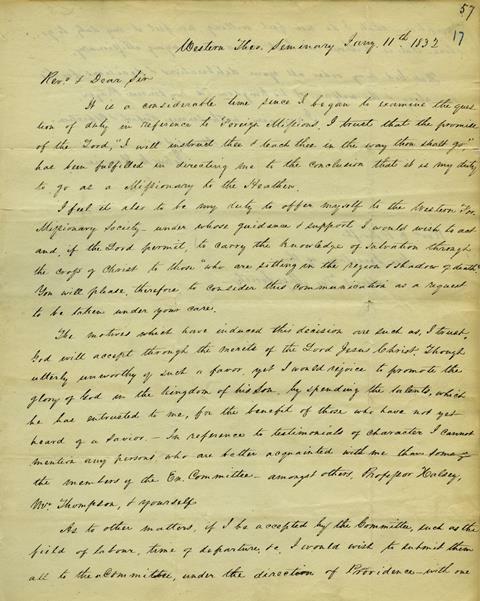 Those in Western Pennsylvania who sided with the Old School urged the General Assembly of 1831 to embrace a "conceptional change" in mission thinking. When their overture failed, the Synod of Pittsburgh chose to create its own mission organization, the Western Foreign Missionary Society, headed by Dr. Elisha P. Swift, an instructor at Western Seminary (one of the original institutions that later became Pittsburgh Theological Seminary). The Western Foreign Missionary Society sent its first missionaries to Monrovia, Liberia, and Lodiana in the Punjab of North India (now Pakistan). Six of the eight missionaries it initially sent died within months of their arrival. Western Pennsylvanians, however, refused to be daunted. During the six years of its existence, the Western Foreign Missionary Society sent twenty-one missionaries to evangelize Native Americans in the western United States, and thirty-nine missionaries to Liberia and India. At the General Assembly of 1837 the theological dispute between the Old School and New School resulted in a second schism. The Old School wing adopted the Western Foreign Missionary Society as its denominational mission organization, changing its name to the Board of Foreign Missions and moving the headquarters to New York City. The New School denomination chose to continue to send missionaries through the ABCFM. However, by the time this latest division in the denomination was healed in 1869, the New School had already begun to support the Presbyterian Board of Foreign Missions. Western Pennsylvania has always been an important supporter of denominational mission. The United Presbyterian Church of North America, a smaller Presbyterian denomination headquartered in Pittsburgh, built a strong record of missional engagement in Egypt, Sudan, Ethiopia, and Pakistan during its 100 years of existence from 1858 to 1958. The region also contributed some of the great Presbyterian pioneer missionaries such as John C. Lowrie in India, John Kelly Giffen in Sudan, and Don McClure in Ethiopia. All of these missionaries graduated from one of the progenitors of Pittsburgh Theological Seminary, which continues to emphasize mission in its programs today. It is appropriate that Presbyterian World Mission will mark its 175th anniversary this year at a General Assembly held in Pittsburgh, for it was through the visionary leadership of mission-minded Western Pennsylvanians that this organization came into existence.